For a bit of modern style in your bathroom, choose this beautiful vanity. The beige tan marble counter and grey solid wood base make a beautiful look in your bathroom. There's plenty of space for items in this vanity's drawer and single-door cabinet. Bring a classic look and feel to your bathroom with this beautiful set from Wyndham Collection. Andover 48-inch W 6-Drawer 1-Door Vanity in Black With Marble Top in Beige Tan With Mirror Designed with a classic style and strong build, this vanity is a perfect choice for any bathroom. Its beige tan marble counter and black solid wood base will look beautiful in your home. Room is no problem with this vanity because it comes with a single-door cabinet and drawers. This set from Wyndham Collection is great for anyone looking for great style and function in their bathroom. 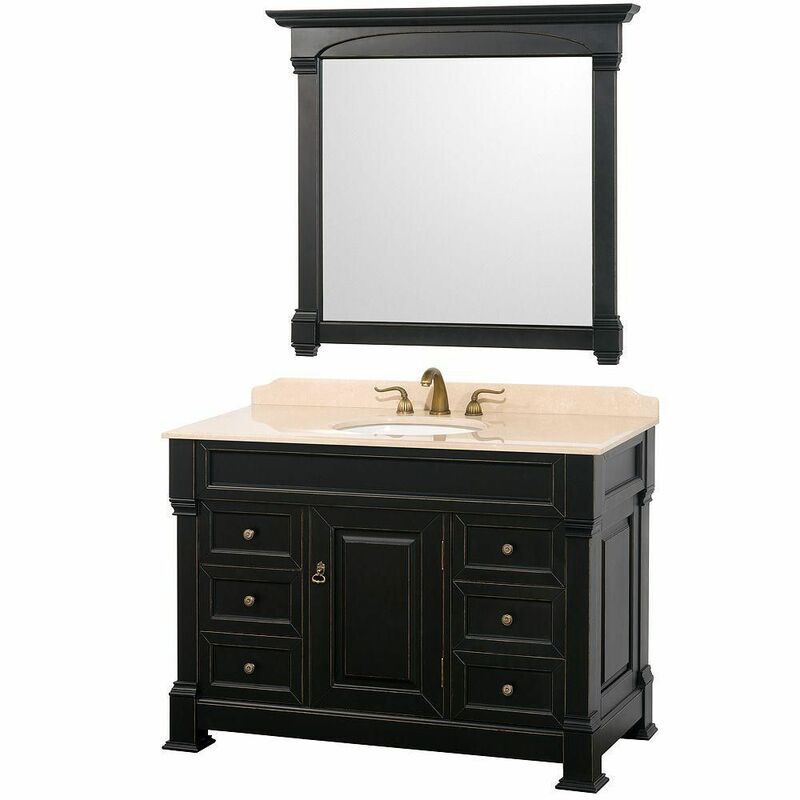 Andover 48-inch W 6-Drawer 1-Door Vanity in Black With Marble Top in Beige Tan With Mirror is rated 4.5 out of 5 by 30. Rated 5 out of 5 by HomeDepotCustomer from Nice quality and easy to install. ... Nice quality and easy to install. Rated 5 out of 5 by RRS from Excellent quality, all three pieces. Very well packaged, not a scratch, secure on pallet , vanity... Excellent quality, all three pieces. Very well packaged, not a scratch, secure on pallet , vanity top was in wood crate filled with Styrofoam., then all three items were wrapped securely.Home Depot loaded the pallet with all items in our truck. Even got 15% off. a win all the way around. Rated 5 out of 5 by debinky from We are in process of installing this cabinet for our bath remodel. I was a little worried about ... We are in process of installing this cabinet for our bath remodel. I was a little worried about ordering site un-seen ( when returning it was impractical, but this cabinet is everything I hoped for ( and more)! It's gorgeous, nicely distressed finish., very substantial and well-made, and the marble top is beautiful. Love it- We couldn't be happier! The only issue with had was with the local freight delivery to home- they couldn't tell us more than a day in advance when it would be delivered and no timeframe. As we both work a distance from home, this was a challenge, but turned out to be well-worth it. Rated 5 out of 5 by Oma from Exactly as pictured and described. I’m happy with my purchase. Exactly as pictured and described. I’m happy with my purchase. Rated 5 out of 5 by NickinNY from The Vanity, counter, sink and mirror exceeded my expectations for... The Vanity, counter, sink and mirror exceeded my expectations for looks, craftsmanship and quality. I feel I’ve gotten great products at a great price. Rated 5 out of 5 by HomeDepotCustomer from Vanity and mirror were beautiful. Very nicely made. Wished... Vanity and mirror were beautiful. Very nicely made. Wished the drawers were self closing. Rated 3 out of 5 by John145 from We received the vanity and the mirror was in a... We received the vanity and the mirror was in a thousand pieces. The backsplash was broken in half. We are awaiting the replacements from Wyndham, it’s been five days.